Constellation Cygnus with Albireo circled at the Swan's head. Image via Stellarium by James Guilford. Albireo A is yellow star, slightly cooler than our Sun. It has a surface temperature estimated at 7,000 degrees F., compared to the Sun’s 9,000-degree F. surface temperature. Its companion, Albireo B, is a hot, blue star with an estimated surface temperature of about 23,000 degrees F. It also rotates very fast — at about 560,000 MPH. When we are looking at Albireo, we are actually seeing three stars. Albireo A is, itself, a close binary star. Most of us, however, can’t split this pair with our telescopes. It takes a minimum 20-inch telescope under really good sky conditions to split Albireo A. Paul Leopold with his 20-inch scope is probably the only CAA member who has a chance to see all three stars in Albireo. 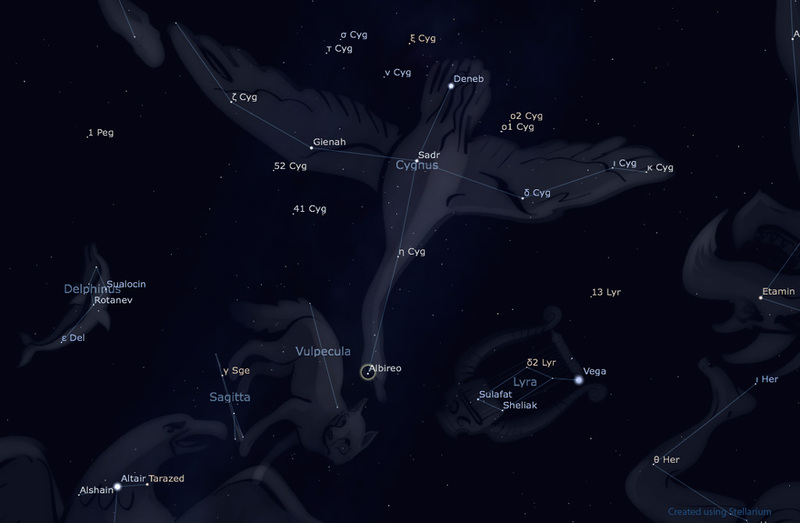 This entry was posted in Uncategorized and tagged Albireo, constellations, cygnus. Bookmark the permalink.